Let’s introduce you to Google Knowledge Graph. The purpose of Knowledge graph is to allow Google search to understand,…well things. It’s Google’s way of implementing revolutionary technology to incorporate a human element into search. When you perform a search for a type of building, Google will provide you with an instant answer to the search question. Google has announced that the knowledge graph will be available to the US only, but soon rolled out on a global scale. This in response to Bing’s similar search element called the Snapshot. While many think this was a response to Bing, Google knowledge graph has been in the works for years. 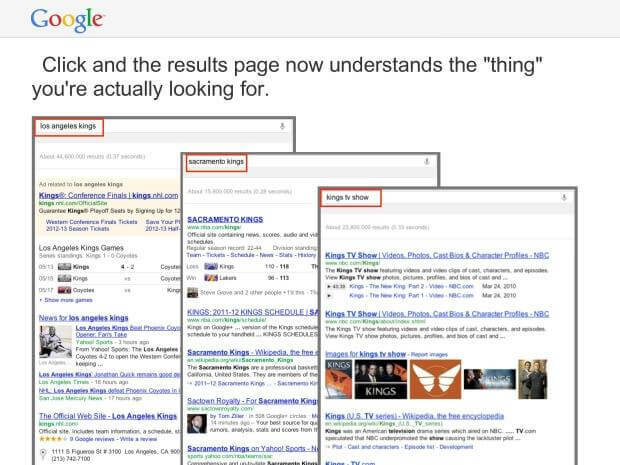 Google Knowledge Graph will offer a change with how users interact with search. Instead of providing search results of the top websites of a respect keyword, Google will provide users with a portal to the web. For example if you are looking up a historical place on the web, you will see a summary from a relevant source such as Wikipedia. The idea behind Google Knowledge is that broad keywords are interpreted as different things to various people. This makes for big change to the way Google provides its search results. 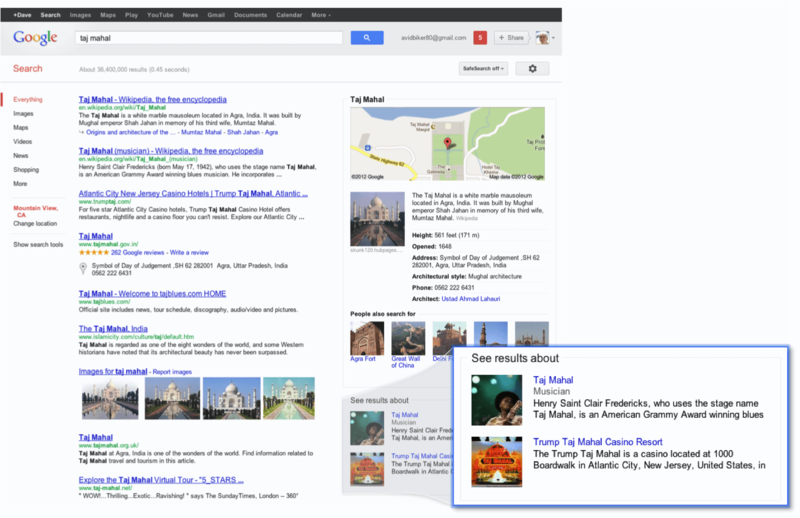 Google has been advertising Google knowledge by showing examples of Taj Mahal. Everything is according to the users data. Google will take a look at a user’s location, past searches, social sharing on Google + among other things. If the user is a college grad student looking for historical data for a history lesson; or the user might be on vacation looking for data on the Taj Mahal Casion; the search will produce intelligent results based on the portal that the user is really looking for. This is just another step in search intelligence. Users will be able to find more information that is personalized towards the user’s data. Google has graduated from a directory listing website to a funnel of all valuable content on the web. You are now able to find information on the web that you would never be able to find through using the past search. Your results will find more information from social media outlets such as Wikipedia, LinkedIn, Facebook, and Pinterest. Two words, one name. Larry Page. Ever since he has re-established himself as CEO of Google last year it has been his personal mission to integrate a platform that lets users find everything they desire without leaving a single platform. Google is a strong believer now that search and social media should combine and will merge platforms. They understand that if they can keep users on their platform for more time, this means more money and growth for Google. What this Means for Online Marketing Companies? As a top online advertising agency, it’s our job to be up to date with the new technology within the industry and how it can affect our clients and their budget. This is what this potentially means for your advertising spend. 1. For now SEO is king. But you need to make sure your SEO Company is aware of the market. SEO is changing at fast pace and you need to be ready to put your budget in another avenue at the blink of an eye. 2. Be in Front of Google. The more real estate you own on Google to more adaptive you will be for change. It’s even more important that you have a great website as well as an organic footprint all over the web. Start putting up more Images, Videos, Blogs, and social media posts. 3. More Content. To Google content is data. The more content and images you have with your name on it, the more likely your site pops up within a specific search. Google is looking to pull more date from other sites, which means that onsite content becomes just as important as your link building strategy. The more valuable content you create the more chance you give your company to build your brand. 4. Create A Stable Social Media Campaign. As Google has indicated that they want to incorporate as much social media as possible with search, the more social media you provide to them the more impact you will have on Google. As personalized search is becoming more relevant the more friends you have on these social media platforms allows you to influence more peoples search. 5. Your Brand is everything. When users do a search for your company Google is going to promote your brand. Your information is going to be found including your logo, videos, and customer reviews. Start building your corporate identity and invest within yourself early. 6. Google is making Google + an influence. Update your Google + Profile regularly. The more you share your information with Google+ the more likely the content you provide will show up within the search. 7. Generate HIGH QUALITY LINKS. At Noxster this is never an issue but with other companies not so much. You need to be generating high quality inbound links into your website. This is a vital part of Googles algorithm. The more content you generate the better chance for you to obtain quality inbound links to your website. Be an influencer on social media, social profiles, and try posting on credible forums within your industry. 8. Get More Traffic. Knowledge Graph is going to drive traffic to your website from all over the web. Rank for long-tail keywords and variety of traffic generation to generate your best ROI.